Vintage From Paul is delighted to offer these Syracuse Radisson Cable Beach Resort New Millennium Platters. 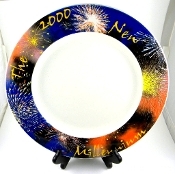 These Syracuse Radisson Cable Beach Resort New Millennium Platters were manufactured by Syracuse China for the Radisson Coral Beach Resort for the celebration of the New Millennium New Year's Celebration in 2000. Each of the available Syracuse Radisson Cable Beach Resort New Millennium Platters is in pristine unused condition. The Syracuse Radisson Cable Beach Resort New Millennium Platters are marked with; "Radisson Cable Resort Nassua BahamasMade By Syracuse China".